Searching for the best romantic getaway destinations? Look no further. South Carolina vacation packages offer outdoor adventures, resort island getaways and hidden gems yet to be uncovered — perfect experiences to share with that special someone. Rediscover what matters most on a romantic South Carolina vacation. 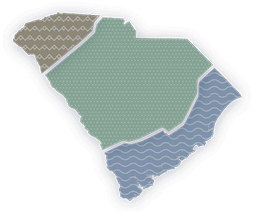 As one of the world's premier wedding and romantic vacation destinations, South Carolina's beautiful mountain trails, blackwater rivers, golf resorts and charming Lowcountry towns are the perfect places to escape the everyday — and get back to what matters most. From moonlight paddling at Cheraw State Park to sunset strolls along the shore at Edisto Beach State Park, discover romantic activities for couples to enjoy at South Carolina State Parks. From long walks on the beach to watching the sunrise over the beautiful Atlantic coast, Charleston is one of the best romantic getaways in all of the Palmetto State. Enjoy a quiet dinner at one of downtown Columbia’s many locally-owned restaurants or venture off the beaten path. No matter what you decide, there’s something for every romantic to enjoy in Columbia. Show that significant other just how special they are by bringing them on a romantic getaway to Greenville, with intimate accommodations, hot air balloon rides, great food and lively entertainment. With miles of white, sandy beaches, beautiful resorts and unbelievable sunsets, Hilton Head Island is the perfect romantic getaway. Surround your love with luxury on a romantic getaway to Myrtle Beach, with relaxing beaches, beautiful sunsets and everything else the two of you desire. No matter what your idea of a romantic weekend away is, South Carolina can make it happen. From mansions and treehouses to cabins and estates, SC is perfect for a weekend with your sweetie. A romantic getaway in South Carolina's Midlands wouldn't be complete without a stroll through Columbia's Riverfront Park, dinner at an award-winning restaurant and a trip to the theater. Get away to Table Rock State Park and stay in one of 12 cozy mountain cabins. Wake up to views of Upstate South Carolina's Blue Ridge Escarpment and enjoy all the amenities the park. Whether you want to cruise the Charleston Harbor for a couple of hours or set sail for an overnight adventure, Charleston Charters can create a custom adventure just for you.